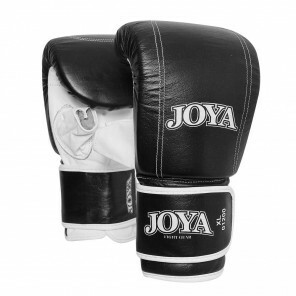 This good quality and affordable leather boxing glove by Joya is very comfortable and easy to use. Made of sturdy leather with an excellent padding that protects your hands extremely well and has an open thumb These Joya bag gloves are suitable for a workout on a punching bag on every level. The boxing glove is easy to put on and take off due to the elastic closure. 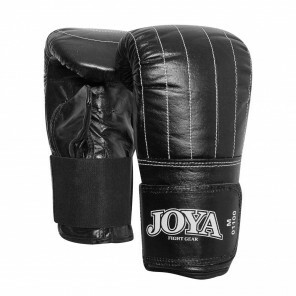 These Joya bag gloves are suitable for a punching bag training on every level. Made of sturdy leather with an excellent padding that protects your hands extremely well Finished with white stitching and a closed thumb. Pocket gloves from Joya, with closed thumb. This slim glove has a good grip and a thick foam layer for shock absorption. This makes the glove suitable for punching bag training at every level. Made from high quality leather and fitted with the Joya Fight Fast logo in black.